Thoughts, analysis and general musings. Written by The West Wing‘s Aaron Sorkin, HBO’s The Newsroom is one my favourite new television shows this year. 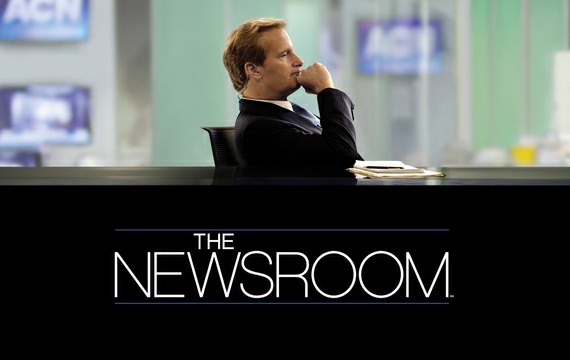 Starring Jeff Daniels as news anchor Will McAvoy, it’s the story of…drum roll…a newsroom. A television newsroom to be exact – an important distinction. McAvoy is the hard-hitting main man at “News Night”, which screens on the fictional Atlantis Cable News (ACN) channel. The show is trying to rediscover its place in the news landscape and establish an identity that is in line with traditional news values. But it’s easier said than done. News Night’s producers face constant pressure from “above” to sacrifice journalistic integrity in favour of the network’s commercial interests. The Newsroom‘s soundtrack is, for the most part, naturalistic – rich (not heavy) with well-written, perfectly recorded dialogue and context-driven ambient noise when appropriate. Music doesn’t play a huge role, but occasionally a pre-existing song is used to add something extra to a scene. Notably, the use of Elvis Presley’s “Burning Love” in episode three and Coldplay’s “Fix You” in episode four. Because the narrative is so dialogue-driven, and despite the fact that the show is about making television news – a profoundly visual beast, I think the program would still have meaning if presented in a solely audio format. It’s a big call, one I arrived at after (as was suggested in the first ‘Modern Soundtrack’ class) closing my eyes and “listening” to portions of episode four of The Newsroom. The only thing I found disconcerting was when elements of the soundtrack undergo changes in sonic quality that are driven by a change of shot. When only listening to what was going on, the changes were confusing because I didn’t know what motivated them. The best example of this from episode four was McAvoy’s presentation of a story about the lies of the Tea Party. McAvoy and various audio grabs are heard from a variety of locations (the control room, out of a television, from in the news studio etc.). His address is cleanest in the news studio. In the control room, it’s played back in mediated form through what sounds like television speakers. Sometimes McAvoy’s voice fades into the background so that those behind the scenes can be heard. Without the accompanying visuals this sequence would be hard to follow in sound alone. Now, those rare inclusions of well-known songs. Not only does “Burning Love” set a robust, high energy pace for the sequence it accompanies, its lyrics symbolically encompass much of what is onscreen. The words trace the physical feelings often associated with being “in love” – namely an increase in body temperature to “flaming” and heart palpitations. The song begins as McAvoy’s boss Charlie Skinner (Sam Waterston) lights the proverbial fire within the anchor by anonymously supplying him with provocative polling data from Utah. The sequence that follows shows McAvoy grilling a variety of politicians and spokespeople in an attempt to reveal what he calls the “radicalising” of the American Tea Party. This becomes the hot issue for numerous editions of News Night. McAvoy is angry, things are heating up. “Burning Love” evokes that. To a lesser extent the song may be interpreted as referring to McAvoy’s feelings for the woman who broke his heart, News Night producer Mackenzie MacHale (Emily Mortimer). She’s hard not to love…pity about that whole cheating thing. I’m going to dedicate an entire post to the use of “Fix You” – watch this space. Until then, although it’s not strictly relevant to sound, I have got to get something of my chest regarding The Newsroom. I’m five episodes in and already hooked. That said, most of the characters infuriate me, particularly associate producer Maggie Jordan (Alison Pill), departing producer Don Keefer (Thomas Sadoski) and News Night newcomer Jim Harper (John Gallagher Jr.). Maggie, Don and Jim remind are members of that frustrating breed who love to flaunt their current affairs knowledge on a regular basis. They are intolerably self-centred most of the time and painfully familiar. They are satisfyingly annoying. Yeah, I don’t get it either. My favourite character is…the news. It’s dynamic, layered and what the show is all about. The other character dramas in the narrative become peripheral. This entry was posted in Television Cultures, The Modern Soundtrack and tagged Aaron Sorkin, Coldplay, Elvis Presley, Newsroom, The Modern Soundtrack, The Newsroom, TV Cultures on October 20, 2012 by kitharvey. Kit. Professional Communication student. I like writing and making radio. I'm also an avid pie maker. [Showcase Post Two] Reality Television: Stranger Than Fiction?